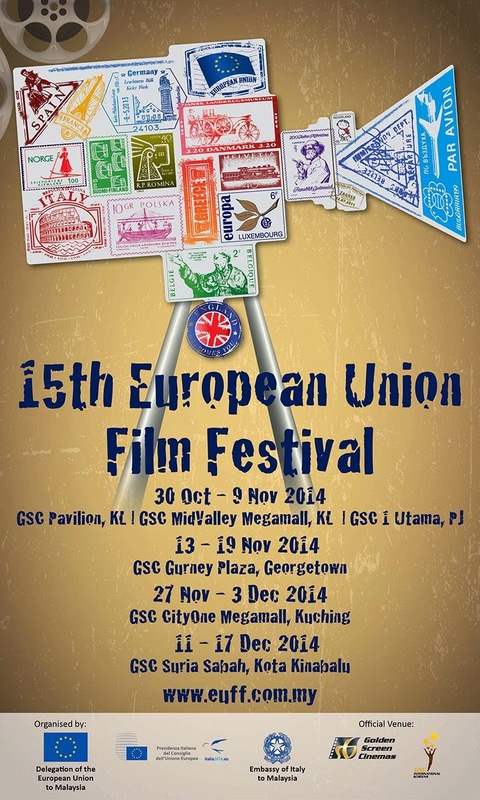 European Union Film Festival (EUFF) Malaysia 2014 kicks off 30 Oct. The European Union Film Festival (EUFF) is back in Malaysia for the 15th year with one of the best line-up of European releases ever, featuring 21 movies of not only comedy, romance and drama, but animation and documentary as well. Most of these films are multiple award-winners and recent Oscar nominees for Best Foreign Language Film, such as The Broken Circle Breakdown, An Royal Affair and my personal favourite, The Hunt. Led by one of Denmark’s best actors Mads Mikkelsen (from the Hannibal TV series and Casino Royale), The Hunt (Jagten) is a Danish drama about a man in a small town who’s wrongfully accused of sexually abusing a little girl in his kindergarten class and becomes a target of a mass hysteria. This film was also listed in my Top 10 Movies of 2012. It’s a must-watch to all those who hasn’t seen it. Mikkelsen also plays the leading role in An Royal Affair (En Kongelig Affære), a Danish historical drama set in the 18th century about the romance between royal physician Johann Friedrich Struensee and Caroline Matilda of Great Britain, who’s the wife of the crazy King Christian VII of Denmark. In conjunction with the festival, GSC Movies will be releasing The Best Offer (La Migliore Offerta), a 2013 romantic mystery starring “Triple Crown of Acting” winner Geoffrey Rush (The Book Thief, The King’s Speech, Pirates of the Caribbean films) and Jim Sturgess (Cloud Atlas, Upside Down, Across the Universe). The story’s about Virgil, an old eccentric managing director of an auction house, who’s hired by a young heiress to auction off the large collection of art and antiques left to her by her parents. The master auctioneer soon becomes obsessed with the extremely reclusive heiress, whom for some reason, always refuses to be seen in person. Although an Italian production, The Best Offer is an English language film. KLANG VALLEY 30 Oct. – 9 Nov.
PENANG 13 – 19 Nov.
SARAWAK 27 Nov. – 3 Dec.
SABAH 11 – 17 Dec.
Tickets will be priced at only RM7, except for the general release, The Best Offer, which will be priced at prevailing ticket pricing, while Snow White and Exit Through the Gift Shop will be screened for FREE. You can book and purchase the tickets via GSC e-Payment at www.gsc.com.my, GSC Mobile App (iOS, Android and Windows Phone) or at participating GSC outlets. The 15th EUFF is organised by the Delegation of the European Union to Malaysia and the Embassy of Italy, in collaboration with the embassies and cultural institutions of 14 other European Union Member States, as well as Norway and Switzerland. Earlier this year, the European Union had also released a cookbook called Europe Uncovered: A Journey of 28 Dishes. Find out how you can get a FREE copy here.